The course at Gulmarg is like nothing you’ve ever seen or imagined before. Situated at an altitude of 2,650 m, it is the highest green golf course anywhere in the world. The layout of the course too is strikingly different from most golf courses– the land slopes and inclines along the complete area of the course, which has a par of 72. There is history at Gulmarg for those interested. The club, started by the British who used Gulmarg as a holiday resort, first opened its doors in 1904, and a charmingly written book traces its past. The J&K Tourism Development Corporation (J&K TDC) now manages the Club.Kashmir offers a unique opportunity to play golf all through the summer – from April to November – in invigorating surroundings, where the wind whispers through enormous trees of chinar and stately pine. In the verdant golf courses at Srinagar and Gulmarg, you will be able to play for longer hours than you can in the plains because of the lower temperatures – Srinagar’s highest temperature seldom goes above 35°C. The layout of both the courses, too, will delight the golfers. 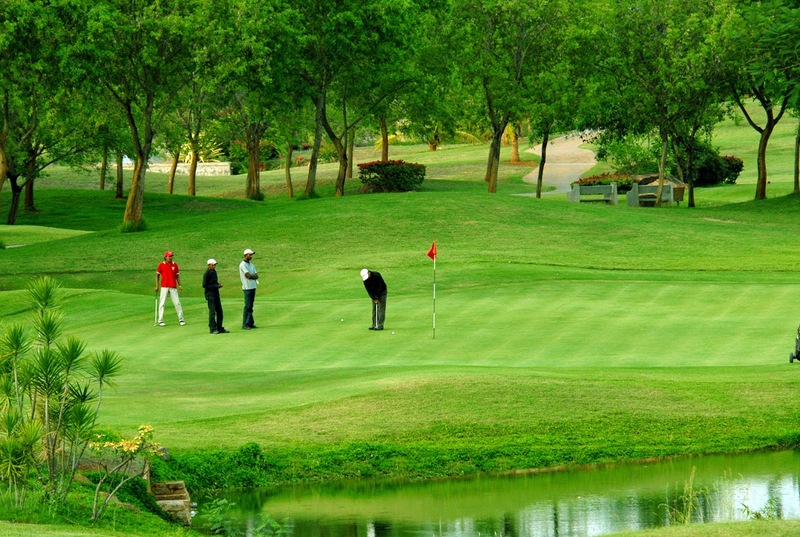 Srinagar has an 18-hole golf course with common fairways, and a par of 70. This course is open throughout the year, unless snowbound in winter.Golf is a way of life at Gulmarg. At an altitude of 2,650 m, in the heart of the world famous resort, is its rolling golf course, the highest in the world. The historic Gulmarg Golf Club was started in 1911 by the British who used the place as a holiday resort. Since then it has seen over four score years of tournaments of both amateurs and professionals, of men, women and children.